It all started back in 1966, a small cabinetry shop located in Southwestern Minnesota with a vision, not only, to provide a versatile cabinetry offering but to ensure quality construction, exceptional service and a affordable price. Today, with three geographically located manufacturing facilities, multiple service centers and over 1,500 dedicated employees our vision remains unchanged. We continue to deliver quality stock framed cabinetry that is flexible in design, custom in looks and priced to meet your budget. Over the past 39 years a lot has changed when it comes to cabinetry. In addition to function; fashion, style, color, design and décor are all integral parts of cabinetry for the home. To meet the needs of this changing and expanding market place we have blended our strength of tradition with the trends of the future, integrating new door styles, multiple stain and glaze finish selections, upgraded technologies and construction modifications. Mid Continent Cabinetry is proud to be an active member of the National Kitchen and Bath Association(NKBA) helping to support, educate and lead the kitchen and bath industry. Mid Continent Cabinetry retains the KCMA seal of certification on its Signature Series, Pro Series and Norcraft Cabinetry Series door styles. The KCMA Certified Cabinet Seal is your assurance that your cabinets have been tested and deemed durable under the toughest kitchen conditions. 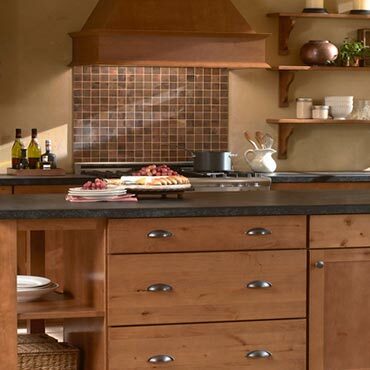 The Kitchen Cabinet Manufactures Association is a non-profit organization that sponsor a nationally-recognized voluntary testing and certification program for cabinets, under the ANSI/KCMA A161.1, Performance & Construction Standard for Kitchen and Vanity Cabinets, which is referenced by the U.S. Government. To serve the market place effectively, a network of independent dealers, distributors, retailers and builders across the United States offer combinations of Mid Continent Cabinetry's; Signature Series, Pro Series, and Norcraft Cabinetry Series to the end consumer. Their extensive knowledge of our products, offering, exceptional design skills and unpresidented customer service provide the key link in matching our cabinetry to your building and remodeling needs. As the parent organization, Norcraft Companies is ranked as the 5th largest manufacturer of cabinetry in the United States. The Norcraft family of brands includes: Mid Continent Cabinetry, Norcraft Cabinetry, UltraCraft Cabinetry, StarMark Cabinetry and Fieldstone Cabinetry. Together the Norcraft family offers a complete spectrum of cabinetry types, styles, designs and prices. Visit norcraftcompanies.com for more Norcraft Companies information.